Why is understanding land use and land use laws important? Land has been credited for securing means to a livelihood and hence for building wealth. Because land renders socio-economic assets, under conditions of land constraints and/or scarcity, land has been a reason for ethnic conflicts and civil wars. In Third World countries, land is conventionally regulated as a common-use resource, albeit owned by a chieftain. Therefore, laws affecting land use and the resources featured within the land spaces are imposed from above. When exogenous actors gain access to land and corresponding resources as an outcome of political relationships, such as colonialism, foreign-trade, etc., local village access and entitlements are restricted. Understanding land use is, therefore critical to understanding how to manage and regulate land ownership and use. Land use, access, and management in Zambia, not unlike other developing countries, has been affected by trade and colonial relations. Land ownership today is guided by customary law and common law. The former, customary law, stems from African customs and is the method by which Zambians conduct their land activities, which include contractual claims regarding marital inheritance, ownership, and disputes. Zambians mediate land activities in the local courts, which in judicial language means the lower district courts. Common law is derived from the establishment of the English colonial government in 1924, which placed significant hectares of land as Reserves or that of the British Crown. The latter was open to only Europeans, an edict that forcibly evacuated Zambians, but reserves were open to Africans. Reserved lands are located in some of the most agriculturally prime areas. After colonialism ended in 1964, Zambia acquired formerly Crown lands that are now designated as State Land, Freehold, Reserves, and Trust lands.Reserves and Trust lands fall under the de-facto management rights of the Chieftains, although power is diluted, and is a status that was extended to them as a diplomatic gesture. Much of commercial agriculture in Zambia are held in State land, the bounties of which are channeled to urban areas. 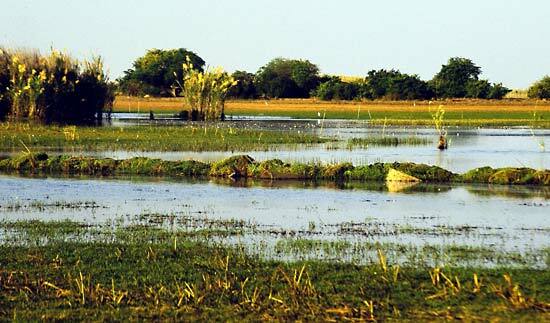 Now, 94 percent of lands fall under the administration of the Zambian government. Like most countries, gender ownership has been delayed by customary laws limiting land ownership to men. Civic groups have proselytized for equal opportunity in land ownership laws, arguing that women in ownership of land will encourage productivity because they are likely to invest more in land they own, reduce economic hardship, as land is the gateway to livelihoods, and will empower women, overall. The climate of Zambia differs across the country, modified by altitude. 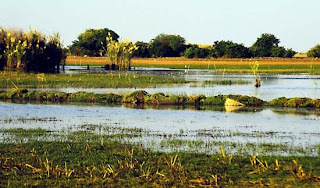 The southern western areas, home of the Luangwa Valley, are very arid and are prone to erosion, while other parts, specifically the Zambezi area, are flood prone. Around the Zambezi region, rain fall (precipitation) can average as high as 55 inches. Agricultural development is challenged by climatic variations and land use history. I thank Martin Adams and the Online Edition of Britannica for improving my knowledge of Zambian land use laws. FUNDRAISING UPDATE: I am now at $280, which includes the checks I have collected at the door and over Christmas. I would like to break $300 by this weekend. Please visit "My Fundraising Page" to the left of this blog and donate today.